Make the most of the powerful Drupal system with our bespoke training courses. From the basics of adding and managing your content, to helping you understand how to optimise your Drupal website and manage your product catalogue. If you have a Drupal website and you’re not confident managing it on a day to day basis, our Drupal training courses are for you! Peacock Carter are a Drupal web design agency, and have clients around the world. We’ve helped clients just like you to understand and master the Drupal content management system. Our hands-on training courses are designed to provide you with the knowledge – and confidence – to go on managing your website long after we’re gone. Optimising your Drupal website: once you have mastered the basics of Drupal, why not develop your skills and learn key optimisation techniques for your website’s content to improve your search engine rankings in search engines such as Google and Bing? We’ve run web training courses throughout the UK for clients large and small, from the Scottish Government to small online retailers, and the pace of the course is carefully considered throughout so no delegate falls behind. Peacock Carter are Drupal training experts. 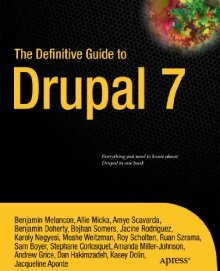 We’ve bee, and have even reviewed a book on Drupal – The Definitive Guide to Drupal 7 published by Apress. If you would like to benefit from our Drupal training courses, please contact us on 0191 499 8456, or by emailing hello@peacockcarter.com. If you would like to benefit from our experience with a training course, please contact us, or use the form below. This helps us to decide how we can best help you within your budget - either online, or in person.